Breakout rooms are sessions that are split off from the main Zoom meeting. They allow the participants to meet in smaller groups. Breakout rooms can be used for collaboration and discussion of the meeting. The host will need to invite you to join the breakout room. 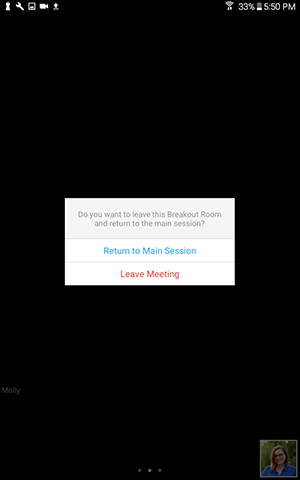 If you choose Later, you can join by clicking the Breakout Rooms option in your meeting controls. Record - you can record the Breakout Room locally if the host gives you recording permission. Read more about local recording. If you click Ask for Help, it will notify the meeting host that you need assistance and they will be asked to join your breakout room. Click Ask for Help in the meeting controls. Confirm that you would like assistance by clicking Invite Host. Ask the host for permission to record. The host needs to allow recording before opening the breakout rooms. If the host has already open the breakouts rooms, they can join your breakout room to allow you to record. Click Record in the meeting controls to start a local recording. Click the pause or stop icon in the meeting controls to pause or stop the recording. You can leave the breakout room and return to the main meeting session at any time, or you can leave the meeting entirely from the breakout room. Choose if you want to leave the breakout room or the entire meeting. When the host ends the breakout rooms, you will be notified and given the option to return to the main room immediately, or in 60 seconds. If you choose Later, you can join by clicking the Join Breakout Room option in your meeting controls. 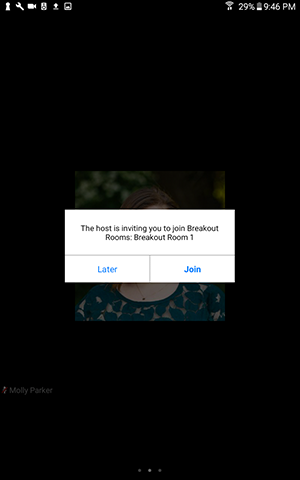 If you tap Later, you can join by tapping the Join Breakout Room option. If you tap Ask for Help, it will notify the meeting host that you need assistance and they will be asked to join your breakout room. Confirm that you would like assistance by tapping Invite Host. If you choose Later, you can join by tapping the Join Breakout Room. If you Ask for Help, it will notify the meeting host that you need assistance and they will be asked to join your breakout room. Confirm that you would like assistance by tapping Ask for Help. When joining a breakout room by telephone, you do not need to do anything to join. Once the host starts the breakout rooms, you will be notified that you have been added to a breakout room. You will be able to mute and unmute like you can in the main session. Use *6 to mute or unmute. You will be notified when the host has ended the breakout rooms and that you will be returning to the main room in 60 seconds. Press # to join the main room immediately.